It takes a special kind of person to work in Antarctica. Max Conway, an ex-Navy Seal, loves working at the bottom of the world. Like any other diver, he's tough and hard drinking. Half the year he's stuck in the States traveling the commercial dive circuit and hitting gay bars every night. The other six months he's lead safety diver at McMurdo Station in Antarctica, reveling in the cold blue Antarctic Sea. The only drawback to life way down under is that Max feels like he has to tuck his libido into storage while he's on station, stashing all those free condoms for use back up north. That is until Andre Dubois, a gorgeous French scientist, shakes up his world. Not only is Andre out and proud, he's sober as the day is long. And the days are long during an Antarctic summer. Max must choose between his comfortable inebriated closet and a life in the sun with Andre. 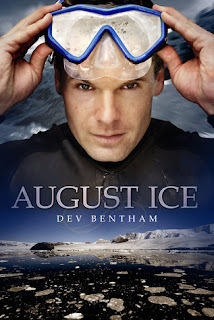 Max, who dreams of being underwater with the seals and the penguins, lives for his half year during the Antarctic summer, does random diving jobs the rest of the time, and drinks enough to submerge McMurdo Station. Between his regrets from the service and hiding who he is, he goes through three people’s liquor rations. He’s also doing things both as a diver and a human that he’s risking fatal screw-ups with his drinking. No wonder Andre Dubois doesn’t want a thing to do with him, especially after their first meeting gets lost in an alcoholic blackout. Most of the book is set in the Antarctic, and this was the best part for me. The characters such as Annie and the chief, and the station itself, a warm and smelly haven from the unrelenting, dangerous cold. The sense of environment was really intense, and the diving sequences had the ring of experience. Andre and Max actually had more chemistry when Andre was first hurt by Max’s forgetting and then aloof because of his drinking. They did start coming together, in spite of his reservations. The second half of the book needs Max to redeem himself after huge lapses, and while he does, I just wasn’t feeling the connection between the men as more than mentor/mentee with benefits. One thing I appreciated was that Max’s relationships with other people didn’t all end up sunshine and roses, which made everything more real. This is a gritty story in a lot of ways, but the tone changed a lot toward the end.